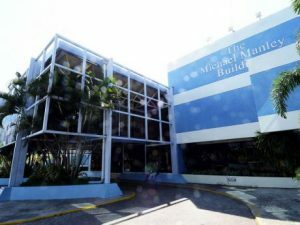 The Center for Advanced Research in Renewable Energy (CARRE), which is housed in the Caribbean’s first Net Zero Energy Building (NZEB) was opened on October 25th 2017 by Dr. The Hon. Andrew Wheatley, Minister of Science, Energy & Technology of Jamaica. An NZEB building is very energy-efficient and generates enough power (from renewable sources) to meet its own needs. There are times when the building is busy, and has to import some additional power, and times when it is quiet, and can export power to the grid, so the ‘net’ in ‘net zero’ means that the imports and exports balance each other out over the course of a year. CARRE is located at the Mona Campus of the University of the West Indies (UWI). It is the result of a research project called the ‘Low Greenhouse Gas Emissions: Promoting Energy Efficiency & Renewable Energy Building in Jamaica (LGGE) Project’. This research project was devised by Professors Anthony Clayton, CD and Tara Dasgupta, CD, and funded by the Global Environmental Facility (GEF). Technical assistance was provided by the United Nations Environment Programme (UNEP). Once the NZEB is fully occupied and active, its energy consumption and production will be monitored for one year and the final results submitted to an international accreditation body for zero energy building certification. Above Photograph: Hon. Andrew Wheatley (2nd left), Minister of Science, Energy & Technology, cuts the ribbon to formally open the Centre for Advanced Research in Renewable Energy (CARRE), at Jamaica and the Caribbean’s first Net Zero Energy Building (NZEB), at The University of the West Indies, Mona, on October 25, 2017. Sharing the moment are (l-r) Principal Investigators of the Low Greenhouse Gas Emissions: Promoting Energy Efficiency & Renewable Energy Building in Jamaica (LGGE) Project, Professors Anthony Clayton and Tara Dasgupta and UN Environment Programme Jamaica Officer, Alexandra Karekaho. 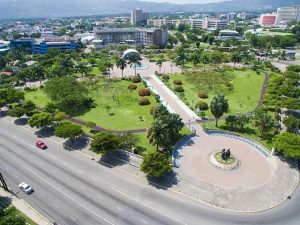 The National Housing Trust (NHT) headquarters in Kingston, the adjoining car park and the Emancipation Park are to be retrofitted for improved energy efficiency. This program is guided by an energy audit that was recently completed as part of the ‘Low Greenhouse Gas Emissions: Promoting Energy Efficiency & Renewable Energy Building in Jamaica (LGGE) Project’, which is managed by the Institute for Sustainable Development, UWI. A Memorandum of Understanding was signed between the NHT and The UWI in 2016 to cover the assessment of the most advanced retrofit solutions to increase energy efficiency and performance of existing buildings. The NHT headquarters complex is now a demonstration project under the LGGE. 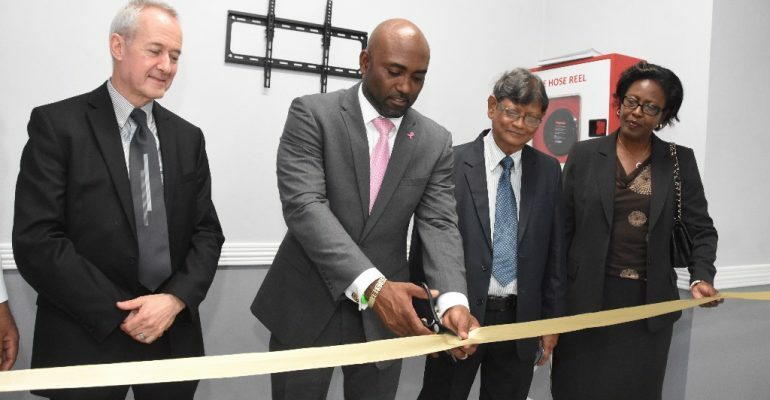 It is designed to show how energy efficient building technology can be used in both retrofit and in new construction, so that contractors and builders in Jamaica have a good example to follow. The retrofit ideas used in the NHT buildings can all be easily adopted and used in construction projects anywhere in Jamaica.